With all that testosterone pumping around, he still made room every once in a while for the women folk. Don’t get me wrong, even his swarthiest male adventures (The Man Who Would Be King, Treasure of the Sierra Madre) have a historically strong female audience. But I would posit that Heaven Knows, Mr., Allison succeeds because it’s the perfect rendering of the complexities of a man and woman who would never meet under regular circumstances, that end up together under a most irregular series of events. Both characters are presented believably and sympathetically. 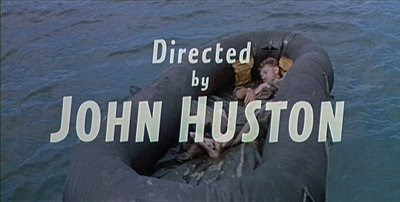 But for some reason, it’s one of those films I never remember Huston directed. It could be the theme, or it could be the light touch he takes, one that never reveals a forceful or “auteur”-ist point of view. Heaven Knows, Mr Allison shares the same universe as The African Queen; a rough and tough man and a prim and proper religious woman, existing on the edges of a world war who need each other to survive, and find ways to navigate the others’ personality and the rugged terrain to safety. 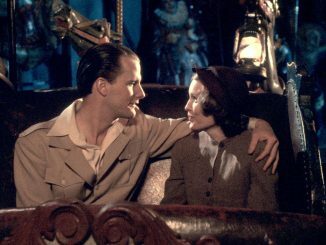 But where The African Queen is first and foremost an adventure, with the romance a close second; Heaven Knows, Mr. Allison is primarily a romance, with a little action, (most happening off camera) and the adventure is part of the backdrop to set the relationship in motion. It’s 1944, and a marine washes up on a small pacific island. He’s near death’s door, but able to drag himself ashore and quickly realizes there is, or once was, civilization, by way of some thatched huts and crude graves. The most sturdy looking building is a church on the side of a hill. He struggles up to it, and almost passes out when a nun emerges from the door, sweeping the porch. She looks just as surprised to see another human as he is. She helps him inside, and he loses consciousness. The nun, Sister Angela, feeds the marine with the last remainders of her food, and they begin to get to know one another. She explains that she and an older priest had arrived only recently to help evacuate another clergymen, when they discover the Japanese have already arrived. A skirmish ensued, the natives were either killed or driven off, and the elder priest succumbed under the harsh conditions. The Marine, Corporal Allison explains that he and a reconnaissance team were caught in crossfire after disembarking a Navy submarine and left adrift. He was the only survivor. When she explains they are about 300 miles from Fiji, he at first mentions if he were alone he would fashion a larger raft and try to make sail, but now feels responsible for her, and thinks it’s safer if they remain together on the island until the Allies arrive. She disagrees, and wants to work with him to build the raft and set sail. Soon after, the Japanese return, and the two quickly hide out in a cave Allison discovered while hunting for food. A zero squadron bombs the island and strafes the beach with machine gun fire, destroying what was left of the thatched huts and the beginnings of their raft. Once a meteorological camp is set up by the Japanese troops, Allison and Sister Angela have to make the cave their home. He sneaks into the encampment to steal supplies, as she is none to comfortable eating the raw fish. The Japanese suddenly leave again, and Allison and Angela celebrate by raiding the left over supplies. Allison imbibes a little heavily on the sake, and blurts out that he loves Angela. He asks her if she’ll marry him, when she explains the wedding ring she wears is her bond with God. Throughout the film, the sexual tension is palpable, ably delivered by Deborah Kerr and Robert Mitchum who know a thing or two about smoldering, unrequited passion. But where you might think the story would digress into a “habit ripper” in the sultry tropical setting, it remains extremely chaste. Both love each other, but Mitchum’s Allison respects the nun’s commitment to her religion, because he discovers it’s not dissimilar to his allegiance to the Marine Corps. He may come from a rough, orphaned background, but the two share ideologies about love and commitment that bond them together. When the Japanese return, and Allison again offers his hand to Angela, she runs off into the rainforest, passing out and getting sick. He carries her back to their cave, where he “gets her out of her wet” clothes. Again, an opportunity for some secular coupling, but instead, he is the gentleman. For the first time, we see her short red hair, and a bit of shoulder. You can sense he’s aching for her, but instead puts his energies into sneaking back into the encampment to steal her warm blankets. 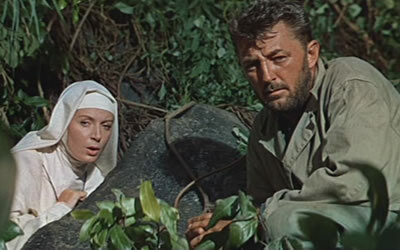 While The African Queen alludes to the fact that Bogart and Hepburn have finally consummated their love, Mitchum and Kerr’s remains, to the end, an unrequited passion. And it’s this romantic notion of spiritual love that probably makes Heaven Knows, Mr. Allison one of the most loved Huston film for his small but ardent female viewership. Twilight Time’s recent Limited Edition release on Blu-ray may not include many extras, but it has a fascinating compilation of Fox Movietone News shorts, covering several WW II items about the Pacific campaign, as well as newsreel footage from the Academy Awards of 1957, when Heaven Knows, Mr. Allison was nominated. 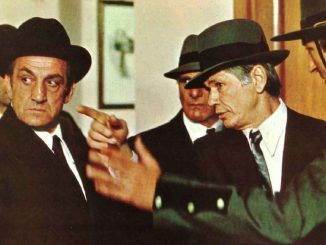 It’s this rare group of extras, and the beautiful Cinemascope print that makes the purchase so worthwhile. Huston was definitely a great director, and he covered many war stories from his excellent Word War II documentaries to Red Badge of Courage and even Victory, one of his final efforts. But Heaven Knows, Mr. Allison showed a unique and mature side to the multi-faceted storyteller, one who understood the complexities of love; platonic and physical. It was his ability to stay out of his own way and serve the story that makes John Huston one of our greatest and most enduring of filmmakers. 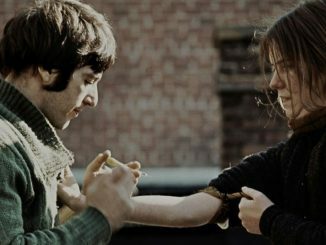 Heaven Knows, Mr. Allison is available as a Limited Edition Blu-ray exclusively from Twilight Time and their partners Screen Archives Entertainment and Shop TCM.